What is the purpose of defining American Music? At least in our class setting, we have treated the desire to define American music as the intellectual endeavor to become an independent nation and establish a sense of musical nationalism separate from Europe. For example, jazz history is often narrated as a quest for an independent, truly American sound. Folklore has also been a source of inspiration; so many composers and musicians have drawn on folk music to establish an unprecedented sound. Other than for pure enjoyment or education, music also plays an important role in politics and society in most, if not all cultures. Why is having a “national” sound so important? Was it to simply have pride in having a uniquely American sound? Or was it to become an independent nation not only politically, but also culturally? Because music is so prevalent in everyday life, it can be a positive or negative force. 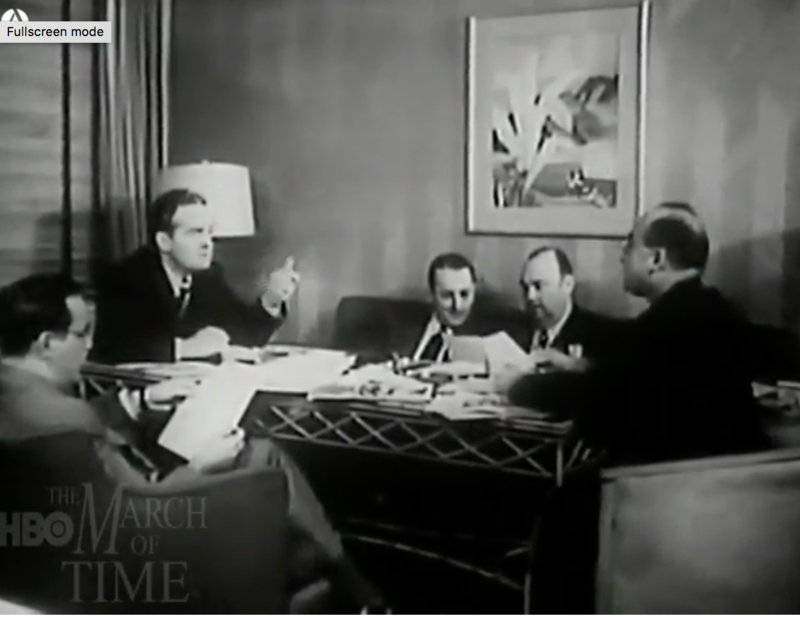 In the newsreel series March of Time, one of the episodes, “Upbeat in Music,” shows just how powerful music can be on a large scale. 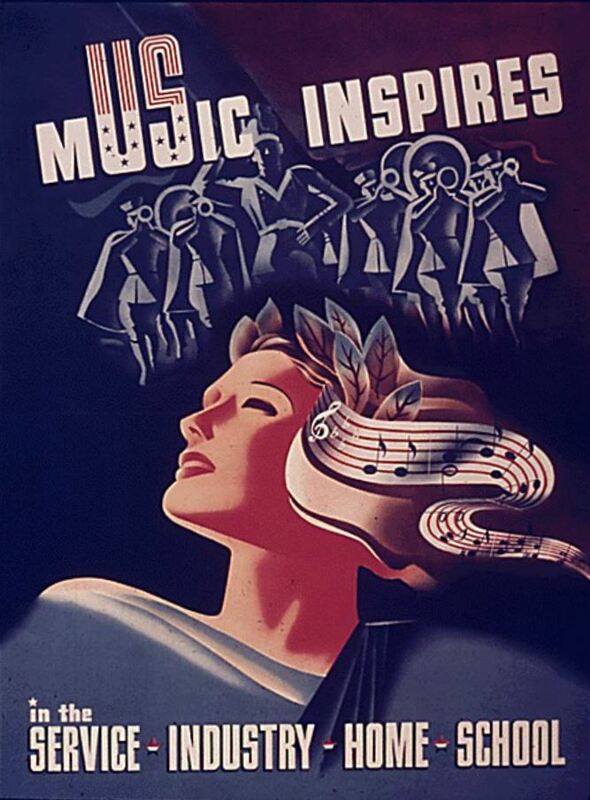 In “Upbeat in Music,” music is being used as a rallying force to encourage people to go to war. It uses the “American” sound to evoke feelings of pride in the US and also excites people with a delusional image of war and what it means to serve your country. The narrator mentions many composers such as Gershwin and Copeland that represented the American spirit. In The Songs That Fought the War: Popular Music and the Home Front, 1939-1945, by John Bush Jones, he states that every song does its part in fighting the war. Since music had such an influential role on society, and also in a sense worked in favor for the government, it had political power. How crazy is that? Because music had political power, there were people who desired to maintain that power. One way music was used as a political tool was through censorship. In Marie Korpe’s article Shoot the Singer! Music Censorship Today, she claimed that music had an important position in organizing political opposition or enforcement. For example, if a certain song relayed messages of rebellion, the government would ban it. 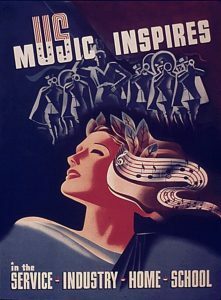 Music had the power to evoke excitement, nostalgia, homesickness and many other feelings that could contribute to the productivity of the war. The idea that music can be used for political or social advancement is not a novel concept. In the time of slavery, instruments were banned from slaves because they could be used as communication and songs to resist masters. The music itself was used to keep spirits up, and also regulate the speed at which they worked. Because this music aided slaves with their work, its use was encouraged because it proved to be useful to the slave masters. This is one example in which musical censorship was employed to control a group of people on a larger scale. Music saturates society and everyday life much more than we realize. With the power that music can hold, it is necessary to be responsible in educating ourselves how it may affect people both positively and negatively. Jones, John Bush. The Songs That Fought the War: Popular Music and the Home Front, 1939-1945. Waltham: Brandeis University Press, 2006. 31. Street, John. Popular Music 24, no. 1 (2005): 153-54. http://www.jstor.org/stable/3877600. Korpe, Marie. Shoot the Singer! Music Censorship Today. Cambridge: Cambridge University Press. 2005. Upbeat in Music. Performed by March of Time . New York, NY: Home Box Office, 1943. Film. 2011. http://search.alexanderstreet.com/view/work/bibliographic_entity%7Cvideo_work%7C1792615.